I can dream, 2011 as well, I hope so. 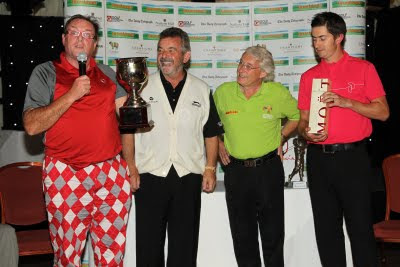 Oct 15th The Florida Open @ The Wanamaker, PGA West, Port St.Lucie. To defend the BP3 , reclaim The Florida Open is a challenge but I am up for it. The success in Scotland has give me great heart and indeed anticipation. 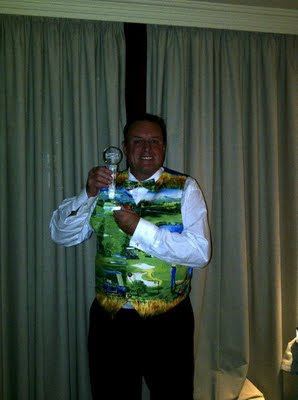 I am now certain to have qualified for The G Tour Race to Cyprus Finals in November at Belton Woods ( were I won Bunkerfest ) so a trip next February to Aphrodite Hills could be a splendid culmination to this years season. 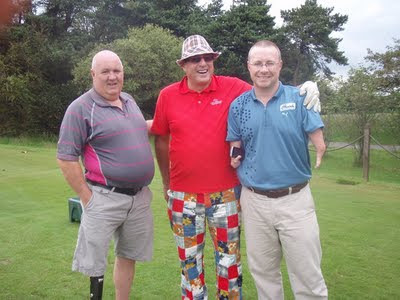 In early July, I ventured North of the border to North Glasgow to play in the SDGP Open and then represent Team England in the Disabilities World Cup.... 8 days constant golf helped by superb rather unseasonable delightful Scottish Weather, were for the entire 8 days apart from one day when Tee Times put back one hour it was shorts and Teeshirts all the way. The SDGP Open was played at the splendid Dullator Carrickstone Course. 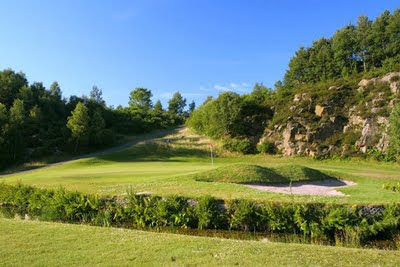 an impressive 36 hole clubwhich was as befitting this prestigious competition in pristine condition. the parkland Course features two distinct loops the new course, the first 8 holes featuring blind holes, long carries, undulating Greens and particularly penal rough.... were scoring for all in the stableford format was particularly difficult.The opening hole a difficult par 3 really sets the tone but the par 3 fifth....one hundred and seventy yards of carry wreaked havoc on all 3 days with 5 balls lost and just one point scored... I hated this hole. The back 9 , the older established course was a far more enticing prospect.... wider fairways, more bailouts, flatter greens and this is where everyone seemed to prosper. 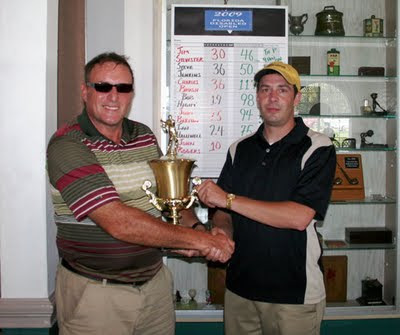 In days one and two to back nines of over twenty points gave me a 3 shot lead going into the final round. Sadly Playing first out, I probably concentrated on keeping young Adrian Canny at bay rather than compiling a winning score... in my defence I had some bad news overnight from back home with the bereavement of a friend.... my mind was not totally on the job in hand.... fair to say however with scores of 35 and 37 in rounds two.... Colin Brock 39, the deserved winner and Andy MacDonalds 39, the runner up... were worthy scores which even at my best would have proved difficult to match... 3rd place on my debut on this tour and a lovely crystal trophy was fair reward and I was well pleased with my form going into the world cup. 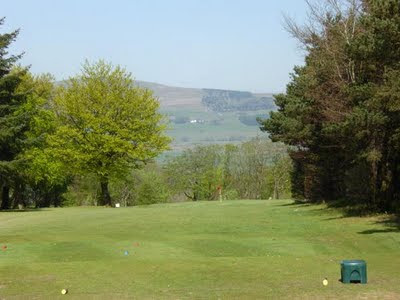 We then moved down the road to the splendid Westerwood Resort for a four day Ryder Cup Format... 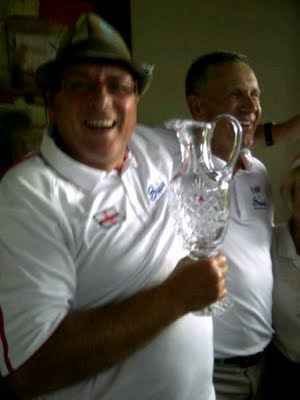 I offered to be paired with Team Englands totally Blind Gofer, Peter Hodgkinson who with his wife and guide Margaret formed an unlikely undefeated partnership of 2 wins and a half which helped propel England to 15 from 18 points and a healthy lead gone into the 12 match singles. The Scots gave us an almighty scare on the last day but Peter and I secured the two victories at the end to both remain unbeaten and an integral part of Team Englands world success. it was particularly memorable because of the magnificent hosting of the event by the SDGP and the camaraderie of the teams. I look fwd to meeting up with many competitors at the British Open later in August.